This Saturday I will be participating in the March for Science in Washginton, DC. It’s all about celebrating science and the role it plays in each of our lives. Frankly, I could have participated in a March for Science one, two, three, or any number of years ago, because these issues have always been important. Over ten years ago, well into my science career, I recognized the need for scientists to come off the sidelines (to quote March for Science) and start telling the world what it is that we do. It’s why I wrote a virology textbook; started virology blog; produce five science podcasts; teach a virology course and record all the lectures for YouTube, and much more. These activities have been my March for Science. Whenever I visit a university to give a science talk, I spend the last 15 minutes telling the audience (mainly scientists) why they need to tell the public what we do. I tell them to let the world know that our lives are long and prosperous because of science. I emphasize that every scientist needs to communicate, so that the public sees us all together championing the way science benefits the planet. The March for Science, held in many different cities, will give the world a view of scientists together defending the roles that science plays in our lives. It’s a large scale view of what I have done myself over the years, and what I have encouraged other scientists to do. It is unfortunate that the March for Science had to be triggered by an administration that shows disdain for science and facts. I bet we could have organized a similar march years ago. But the march is happening now, and whether or not we are branded as left or right doesn’t matter – science doesn’t care about your political party. Neil de Grasse Tyson put it perfectly: “The good thing about science is that it’s true whether or not you believe in it”. More important than the March for Science is what happens afterwards. Does it build a “global movement to defend the vital role science plays in our health, safety, economies, and governments” as envisioned by its organizers, or is it back to business as usual for most scientists? I don’t know the answer, but I do know that there are many scientists who do engage the public, and their work will continue. The work that me and my co-hosts do to bring science and scientists to everyone will go on, as it has before the March. 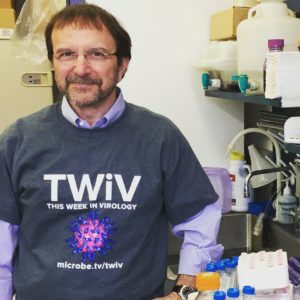 That’s why I will be wearing a This Week in Virology t-shirt to the March in Washington DC. It’s the way I’ve been communicating science, making a difference by reaching as many people as I can. That’s the spirit of the March for Science, which will go beyond one Saturday in April. Heard on TWIV that your students didn’t respond as much as you’d hoped. If I were in the crowd, I would have stood and applauded. I’m in science because I had inspiring teachers and mentors who showed me how amazing and helpful an understanding of the natural world can be. – Kevin V.
Thank you Kevin for the kind words. I know that I should not need validation of these activities, but I thought in a virology class that there would be more enthusiasm. Perhaps the students don’t yet appreciate how important science is to everyone’s lives, but so fragile if we don’t support it.